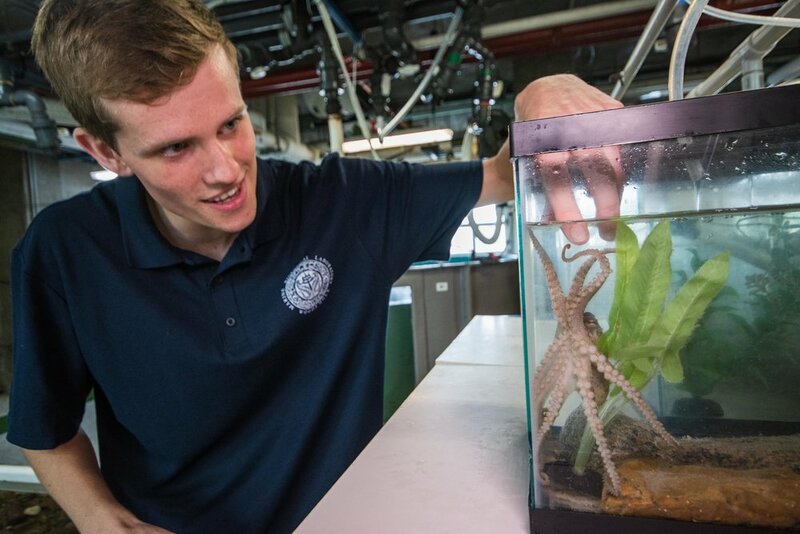 Matt Everett and one of the California Two-spot octopuses held in the Marine Biological Laboratory outreach tanks. A Flamboyant Cuttlefish bobs near the surface of his tank in the Cephalopod lab at the Marine Biological Laboratory. 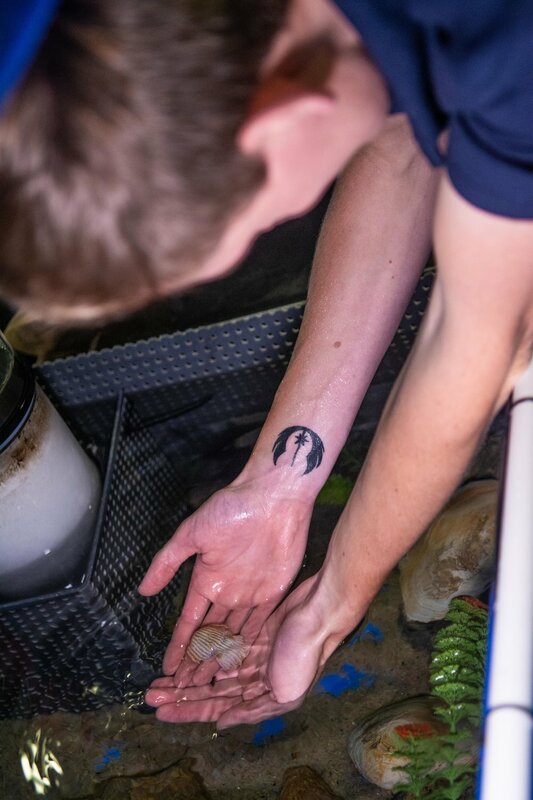 Matt Everett feeds a shrimp to a Lesser Striped Pacific octopus in the lab at the MBL. Raising a new species is “a little nerve wracking,” according to Matt. “On one hand, I’m achieving a dream and I’m getting to work hands-on with animals, doing something no one has done before. But at the same time, if I fail, then that’s just on me. I try to be aware of the big picture but focus on the day to day because that’s what’s keeping the animals alive.” His bosses have had a very hands-off approach as well, encouraging him to be independent and take the project into his own hands. “I’ve asked them a question, ‘do you think I should do this?’ And he said, ‘I’m not going to answer that, it’s up to you, you’re the one in charge.” Matt has risen to this challenge, and dealt with many of the problems he’s encountered on his own, though Taylor and Brett will still help with personal experience if he needs it. The cephalopod lab is only about a year and half old, and it has recently been experiencing some growing pains. 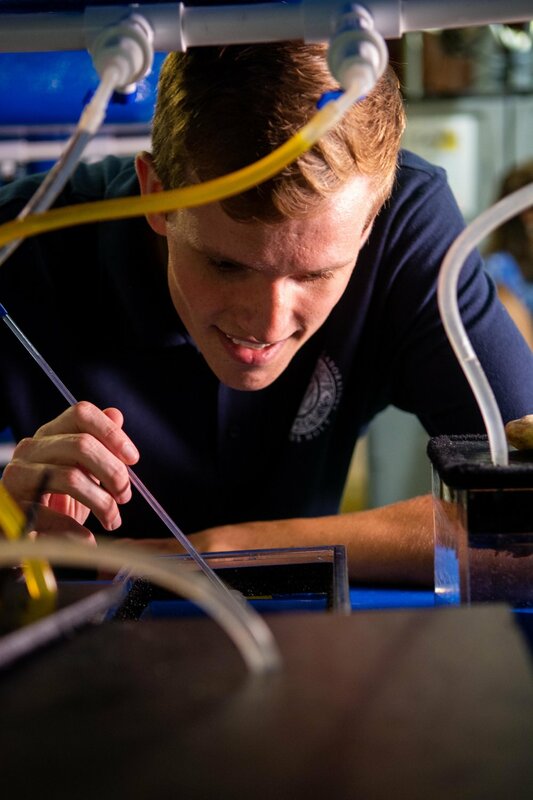 Brett Grasse, the Manager of Cephalopod Operations, and Taylor Sakmar, Matt's supervisor, came to the MBL from the Monterey Bay Aquarium, where Grasse managed the cephalopod program, which held over 30 species. 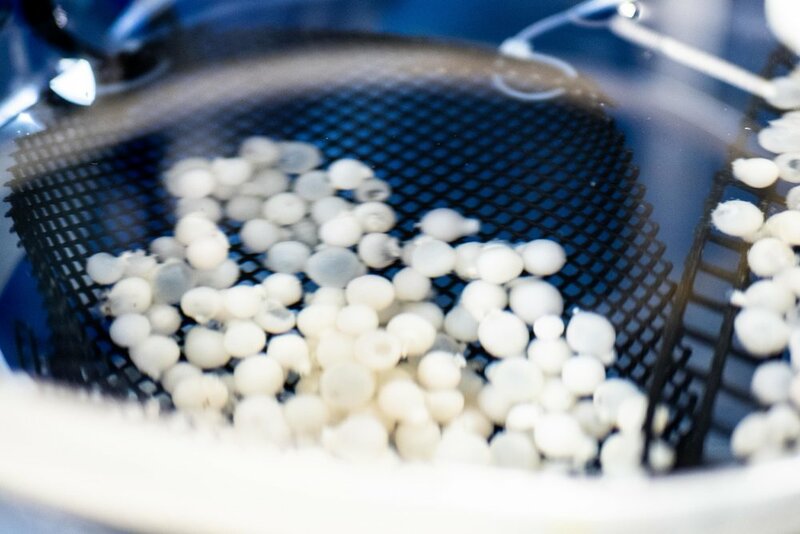 In the new space at the MBL, Matt’s biggest challenge so far has been finding space for his octopuses, partly because they underestimated how many eggs would be laid. “We thought they laid clutches of eggs of about 30, because that’s what one of the clutches was. The second clutch, we’re up to about 45, so that’s a 50% increase. I ended up having to scramble to try to find homes for 50% more animals.” The chierchiae don’t play nice either, in fact they tend to eat each other. Finding appropriate homes for them has been a challenge on top of just having enough, “octos love to live in things, under things, kinda hidden away,” Matt said, “so with some of the hatchlings I’ve been trying out giving them different things to live in, like a different PVC nozzle, small PVC joints, pieces of rubber tubing, to try and see if they react differently to them.” In the wild, octopuses live in cracks and caves in the rocks to hide from predators, often hunting at night when it is safer. A Lesser Striped Pacific Octopus, Octopus chierchiae, displays its dark stripes in its tank at the MBL. While at the MBL, Matt has been able to expand his animal care repertoire, as his day to day has been extremely varied. “I could be building tanks, I could be doing water quality tests, I could be moving animals around, I could be receiving a shipment of animals that someone else has sent us, we could be packaging animals that we’re going to send to other people. I really like the dynamic work environment.” For Matt, this means there’s never a boring day on the job, because it’s rarely the same, something he’s always wanted in a job. “I don't want to have a desk job where I sit and do paperwork, that does not appeal to me at all. I want to be working hands-on with animals because that's what interests me, that's what excites me. This job was the perfect fit for me." A California Two-spot octopus peers over its arms with one eye as it hugs the wall with 8 arms in the outreach tank at the MBL.